Cupcakes are a formality on my blog over the festive period. You can never go wrong with a really good cupcake. A lovely soft moist, flavourful sponge, maybe with an added flavour, or a sauce filling the centre. Then, you have your highly piped buttercream, maybe even more decorations and treats. Everybody just loves cupcakes. It’s like your own personal slice of cake that has had all the love and attention - but it's just for you. This year, for the first time, I thought I would do something a little unlike me and I have stayed far away from chocolate. There is zero chocolate on or in these cupcakes. No milk, no white, no dark chocolate. "Oh no Aycan! Are you okay?" Don't worry, I am still infusing as much chocolate in my recipes as possible, but we are only on our third bake. I have plenty more "death by chocolate" kind of bakes to come. For this bake, I have incorporated my all time favourite flavour; almonds. I absolutely love the taste of all things cherries, amaretto, almonds - you get the idea. The first change I made was swapping a small amount of the self-raising flour for ground almonds. Though this doesn't give much of an almond taste to the cupcakes, it does give the cupcakes a delicate and moist texture. I really wanted to enhance the flavour, so I also added a drop of almond extract. If you don't like the amaretto taste of almonds, leave this out as it can be a little intense. 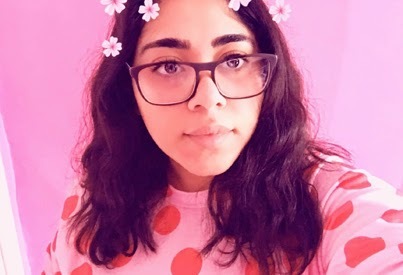 I absolutely love it though. If almonds are a huge no-no for you, you can replace those with self-raising flour and vanilla extract. These cupcakes sound perfect enough right? Not quite, we need something a little more; how about some apples? Chopped apples fill these cupcakes, which brings a slight bite. I love how some of the apples have melted into the cupcakes, resulting in little pockets of smooth apple. Mmmmm absolutely delicious. We need to have at least one apple bake throughout Christmas. The combination of the almond and apple flavours create such a light and fruity party in your mouth. Of course, these cupcakes need a huge swirl of buttercream on top, and for this bake, I have used my new favourite recipe - cream cheese maple buttercream. I first tried a cream cheese buttercream in a recipe, (which is still to come), and I just love how creamy and rich it was, so I needed to include it in another bake. The maple was a new addition, and you'll be thanking me for it once you try these. 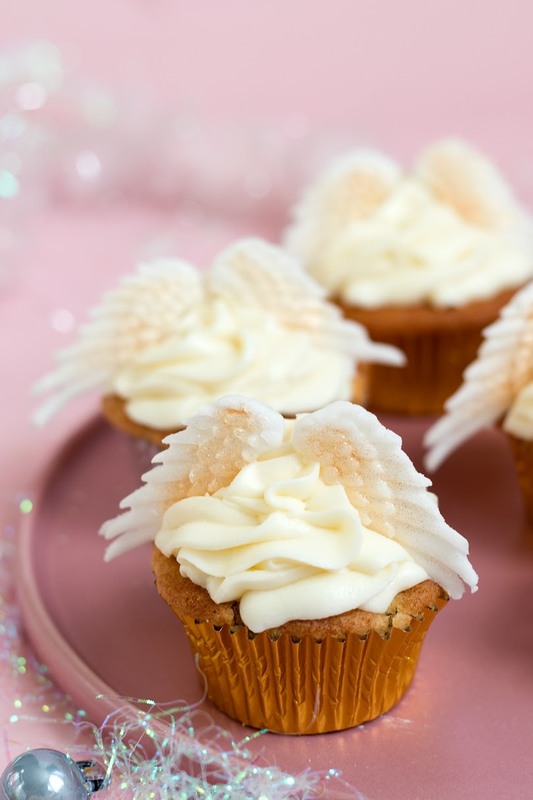 Angel cupcakes wouldn't be angel cupcakes without wings. I wish I could have said I cut and crafted these with my bare hands, but clearly, I haven't. 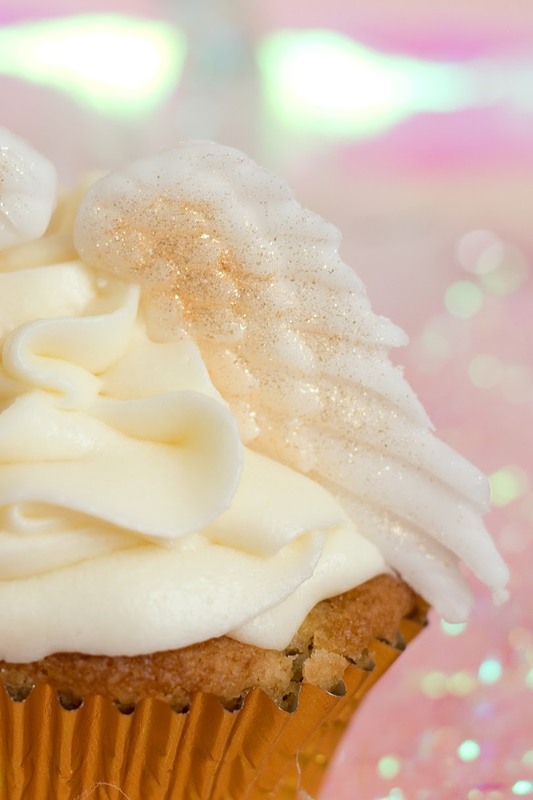 I used a silicone wings mold, which are super easy to use, and I think I may need to purchase a huge selection of these as they can upgrade the look of your bakes instantly. I used white rolled icing, and brushed a little gold glitter (of course with the glitter) on top. I would recommend doing this a day before to give them some time to set. 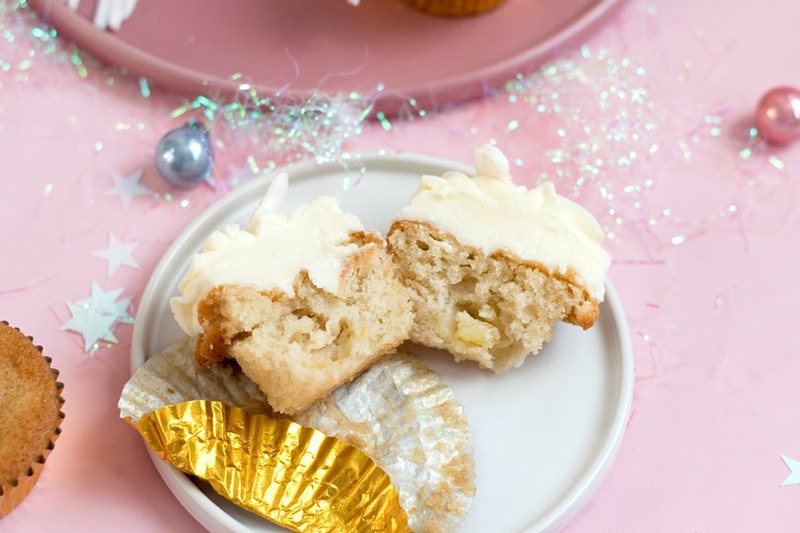 My angel cupcakes are full of flavours - apples, almond and maple. So light, creamy and rich. 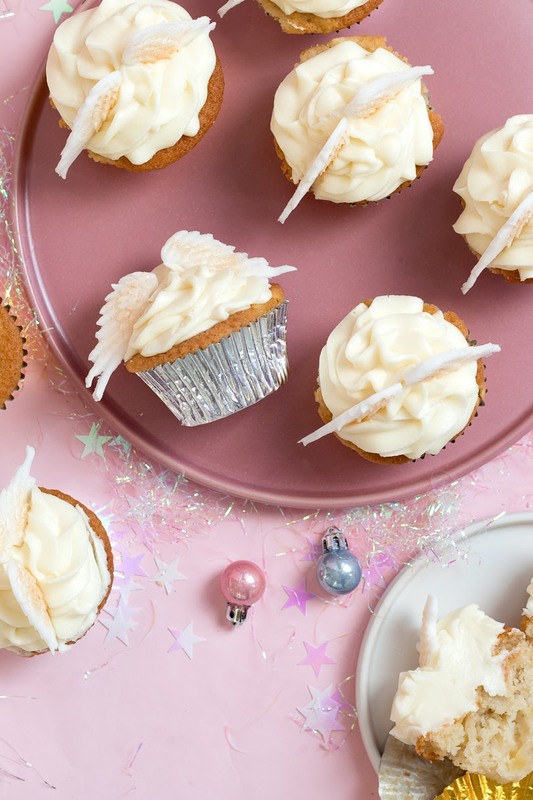 This recipe makes 12-14 angelic cupcakes. Pre-heat the oven to 180°C / 160°C(fan) / 350°F / gas mark 4. Line the cupcake tin with cupcake cases. In a small bowl, mix together the dairy-free milk and cider vinegar. Leave for 10 minutes to curdle - this will be the buttermilk. In a large bowl, sift together the dry ingredients; flour, ground almonds, caster sugar, salt, bicarbonate of soda, and baking powder. Mix together with a spoon. Into the dry ingredients, add the dairy-free milk and cider vinegar mix, flavourless oil, and vanilla and almond extract. This has to be done quickly before the raising agents start working. Evenly pour them into the cupcake cases (about 2/3 of the way full), and into the pre-heated oven for 15-20 minutes. They should leave a knife clean when tested, but also feel springy to touch. Leave them to cool on a cooling rack. To prepare the frosting, leave the butter and cream cheese at room temperature for 15 minutes. In a large bowl, beat together using a hand or standing whisk, the cream cheese and butter until it's light and creamy. Add in the maple syrup, and gradually pour in the icing sugar, one cup at a time. 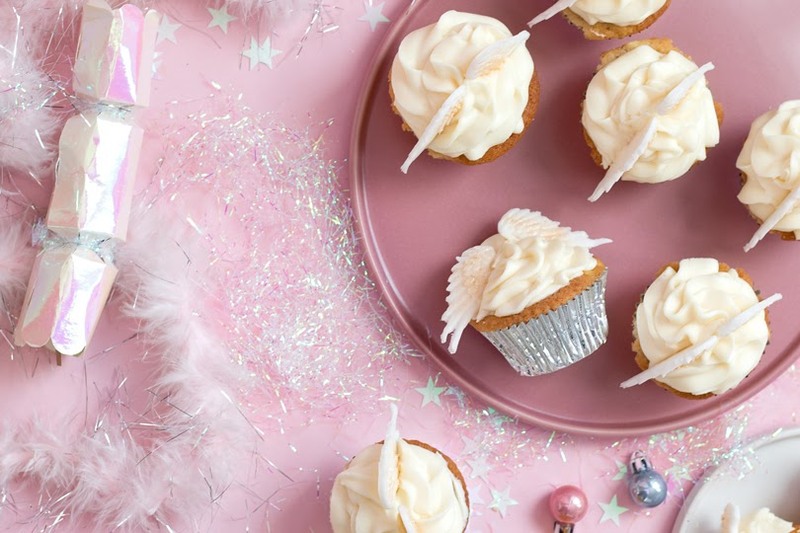 Scoop your frosting into a piping bag, and using a large nozzle, pipe on to your cupcakes. 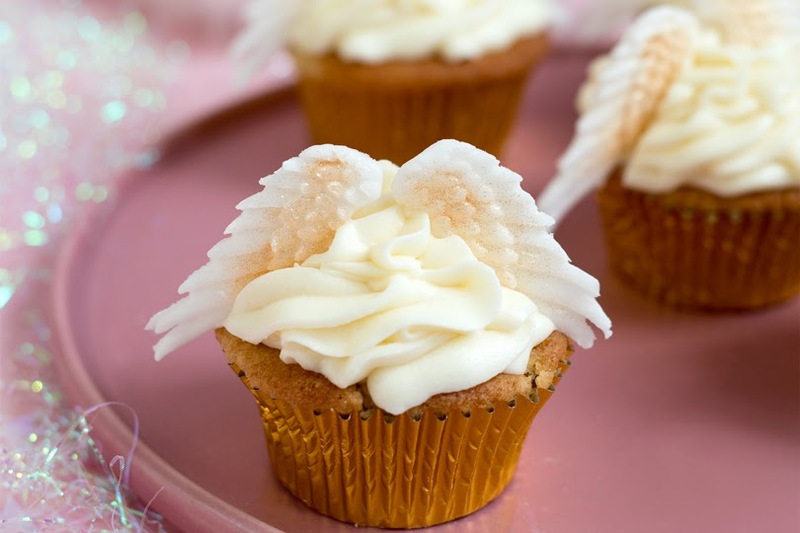 Decorate with fondant angel wings. Let me know in the comments below what you think of these cupcakes; are you a fan, or do you prefer lots of chocolate on your cupcakes? 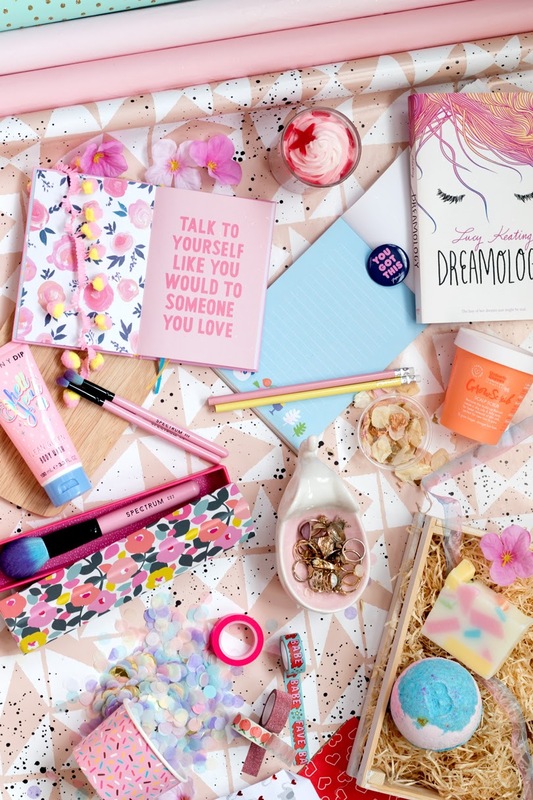 We are 6 days into blogmas, so catchup with all that you have missed on my advent calendar.